Rudy: Does Hard Work Build Character? I’m a sucker for inspirational sports movies. I love stories that chronicle the hard work and dedication of underdogs who achieve the impossible. My guess is that I’m not alone. The fact that a majority of men spent a significant part of their childhood playing one sport or another makes these movies the perfect setting to communicate powerful messages to us. As I’ve watched numerous sports dramas throughout my life, I’ve noticed a disturbing personal trend. For some reason, with sports movies, I tend to drop my guard and mindlessly buy whatever the story teller is selling. My ability to personally identify with the characters often causes me to absorb messages from the film that are in stark contrast to the truth of Scripture. Needless to say, this is dangerous. 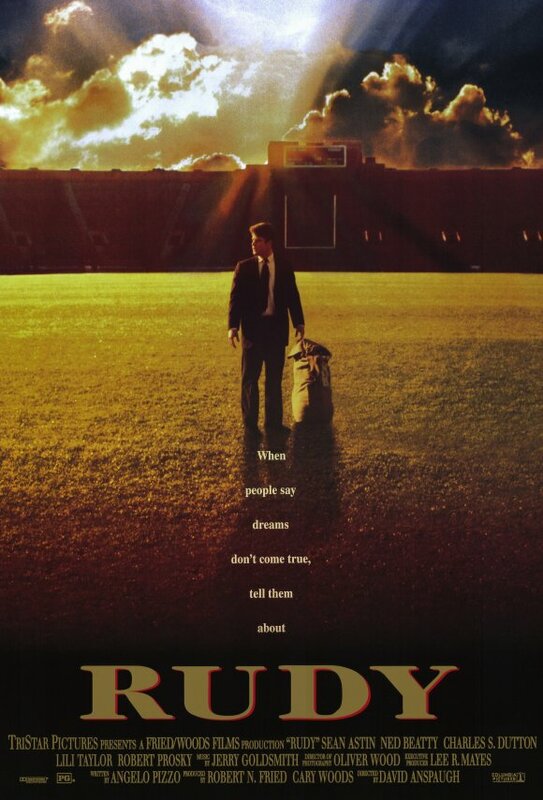 The focus of this post is the film Rudy, arguably the greatest football movie of all time. If you’re one of the three men over the age of ten who HAVE NOT seen this film, you’re in for a treat. It tells the true story of Rudy Ruettiger, a 5 foot 6, 165 pound kid with dyslexia whose one dream is to play football for Notre Dame. Rudy’s limited size and athleticism, not to mention his learning disability, made this goal virtually impossible to reach. But against all odds, he persevered through every imaginable trial, and by sheer heart, hard work, and determination solidified his (on-screen) character and made his dream a reality. As the dramatic final scene of the film plays out, the viewer is left with the sense that Rudy has arrived. You feel as though his integrity and character have been permanently cemented through this experience. You envy his accomplishments in spite of insurmountable odds and long to be as he is, seemingly mature and complete, lacking in nothing and prepared for whatever lies ahead in life. The underdog theme is common in almost all sports dramas, and what can be misleading for Christians is that it appears to be Biblical. After all, overcoming obstacles through hard work is a Christian virtue, right? Aren’t we supposed to persevere and endure trials so that we can be mature and complete (James 1: 2-4)? How does Rudy’s gospel differ from the Gospel of the Bible? The gospel of Rudy appears to be that Trials + Perseverance = Character & Success. Hard work is the lone vehicle of Rudy’s salvation and is the key ingredient to his character development in the film, but does it work in real life? Can hard work save us? Does it build character? Can it bring us success? According to the Bible, the answer to each question above is NO. Scripture explicitly warns us against the dangers of trusting in ourselves for salvation, sanctification, and success. Our salvation is a gift from God and not the result of our works (Ephesians 2:8). Our character is also a gift from God as we are ‘credited’ with the righteousness of Christ (Romans 4). While we are commanded to work hard at whatever we do (Col. 3:23), we are also reminded that hard work doesn’t guarantee success. Scripture informs us that this too comes from the Lord (Proverbs 21:31). Rudy’s gospel is the gospel of the world and of the American Dream, but it isn’t the Gospel of the Bible. So how did Rudy’s gospel work out for him in real life? On one hand, his external life was radically changed by the events portrayed in the film. In addition to having a movie made about him, Rudy went on to become a successful motivational speaker and have numerous awards and scholarships named in his honor. He’s been given keys to various cities and has received honorary doctorate degrees. But unfortunately, the character building formula portrayed in the film was discredited by Rudy’s own actions. In December of 2011, he was charged by the SEC (Securities Exchange Commission) in a scheme to deceive investors into buying stock in his sports drink company. He produced a product similar to Gatorade and lied to potential investors about its performance and demand in the market place. Investors were conned into believing the product was on the rise and as a result purchased large amounts of stock in his company. Just before the sham was revealed, Rudy sold his shares of stock and walked away with nearly $11 million dollars, leaving his investors holding an empty bag. Rudy’s gospel failed to equip him with the character we thought he’d developed in the movie. Instead, it gave him popularity and fame that he leveraged to steal from those who trusted him. It’s easy to demonize Rudy for his deplorable actions, but the truth is, we are no different. Apart from Christ, all of us are despicable human beings capable of much worse if we trust in ourselves for salvation, sanctification, and success. Hard work alone never builds character! It may help us reach goals and achieve some degree of success, but it can never save us. Rudy’s gospel is the exact opposite of the Gospel of the Bible. The beautiful message of the Cross is that our character has already been built for us through the hard work of Jesus Christ. We simply have to cling to it by trusting in Him alone…which ironically, is hard work. Brad Davis is a former missionary at Zhengzhou University in central China, where he taught English for two years. He was also a public school teacher and currently works in healthcare. He currently lives in Brandon, MS with his wife Christie and their one-year old son, Hayes. You can’t lump righteousness and character together. Character is built through hard work, trial, and suffering, which Christ ordains in our lives. It is the thought that hard work and it’s resulting character is enough that is the truest danger. That’s monasticism. Ask Luther or Calvin what they thought of hard work. Great comment Brad. I agree with what you’re saying and I think the post does as well. I don’t think it’s saying that character and righteousness must be lumped together, however, we often do that. Since we are all recovering Pharisees, we often see our hard work as our righteousness. Thanks for sharing your thoughts and getting some good conversation going! Good observation Brad and perfect reply (from my perspective) John. I think we’re on the same page. As you said (Brad) the truest danger is trusting in our hard work/character alone to save us. I completely agree with the character equation you described. But if faith in Christ and His empowerment are removed from the equation, then hard work fails to develop character and integrity portrayed. As a recovering Pharisee, I find Rudy’s gospel very tempting. Thanks man!